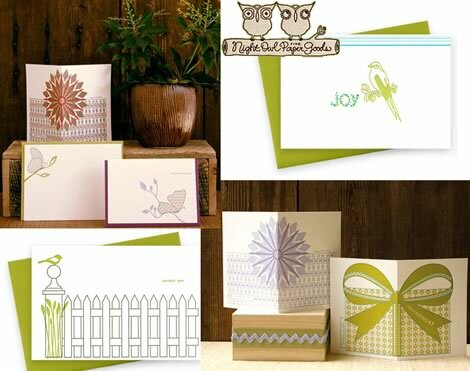 Jennifer from Night Owl Paper Goods wrote to me over the weekend announcing their new website. As soon as I clicked the link, I was in love. Not only is their logo adorable, but I love their woodsy faux bois site filled with fine letterpress stationery. Their theme is simple, clean, modern yet folksy. It appeals to both sexes and is completely charming. My favorites: The wood grain letterpressed moving announcement that slides, the winged message card, and the picket peep in green. Thanks Jennifer for the tip! Myperennial - Initial Pillows at Rare Device!